If you recently visited Danysz gallery – Shanghai, you will be attracted by Jingfang Hao & Lingjie Wang’s newest installation Rainbow, Yun-Meng Lakes, created for the group show MINIMAL LIGHT. The gallery had a dialogue with the couple about this piece which were ardently discussed. Let’s know more about their career. We saw your original artworks about rainbow series, starting with a simple rectangle and going to the complex outline of the lake and sea from last year. What is the opportunity for you to project the rainbow into the rivers and lakes? From water. The small water droplets scattered in the air are clouds, and the condensation drops into rain and snow, falling on the ground to form rivers and lakes. The conformation of rainbow is just when there are still raindrops in the air, and the sun shines on the numerous water droplets. The rivers and lakes that we have chosen, all existed in history and benefited one side, but they have disappeared because of the climate change. Why did the exhibition choose to present Yun-Meng Lakes? Is there any special significance in recreating rainbow in Yun-Meng Lakes? The so-called Yun-Meng Lakes are referred from a poem « While vapours all over the Yun-Meng Lakes up roll, bores roar ahead to rock the Yue-Yang City Wall ». These two lakes, the big one is Yun Lake and the small one is Meng Lake. The Yun-Meng area is a hunting area for the ancient kings of Chu, including mountains, plains, and lakes. The lake area is called Yun-Meng Lakes. Because of the intersection of Hanshui and the Yangtze River, the soil is fertile and has nurtured a valuable culture of Chu. As time goes by, Yun-Meng Lakes have completely disappeared, and only with the help of Meng Haoran and Jia Zhi’s verses to live in our memory. 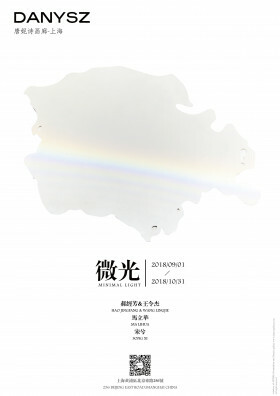 We have heard that you will soon present a sand-faced rainbow in another group exhibition. Is this a new challenge for lighting and space? What difficulties will you encounter in transportation and site layout? In late September, we will participate in a group exhibition planned by Mr. Tang Keyang at Museum of Sichuan Fine Arts Institute. A large rainbow installation will be displayed in the exhibition, and it will be presented on the lower plane of the space. The work will be produced on site, and we have already implemented a similar program at the Lyon Biennale last year. This exhibition hall is a very challenging space. The audience will have the opportunity to climb up the slope on the side of the exhibition hall, and the rainbow will gradually appear in front of the audience in the process. Until the audience walks to the highest point of the exhibition hall, he will see a perfect rainbow shape. We have been working on light from several years ago. To work on light is very tricky, so we did lots of experimental things. As there are many colors in the light, rainbow emerges easily in our mind. By performing and interpreting rainbow in different artistic contexts and spaces, we made our approach to try to understand how rainbow get its form in physical world and also in people’s mind. Most of us have already been told during our middle school physical lessons, that rainbow is formed by the refraction and reflection of sun light through the micro drips of water in the air. However, reproducing a demonstration of the theory is just the opposite of our intention. We explored the world of materials for another medium which could support our ideas to develop the possibilities of rainbow and for example, during the exhibition in Lyon Biennial, we used glass microspheres to change the perspective, presented a rainbow on a quite surface of sand on the floor. In terms of the process of arranging the exhibition, the light source needs to be hung from the ceiling to a specific location in the space. This will be a challenge for on-site coordination. The engineering background of you two makes the artworks more connotative and ornamental. The inspiration for this burning cloud is from the clouds at sunset in Shanghai. Can you tell us about the specific modeling of the cloud and the process of choosing the color of the coating? For example, if you see a cloud in the sky you will think about it in your heart and will ask how this cloud is made? We don’t really care about leaking specific production methods, and there is nothing to hide. But we don’t want the audience’s focus to deviate from the original intention of the work. The burning cloud is just beautiful, sensitive, shy, it is the cloud that can change with the environment. What are the similarities and differences between the clouds exhibited in Shanghai and in Europe? In terms of form and technology, they are basically the same. But the two works exhibited in Shanghai this time are called A step to Sky, 19h01 and A step to Sky, 19h28. The origin of the two names is closely related to the position they are exhibiting – the longest day of the year – June 22 in Shanghai, when the sun goes down to the horizon, and when the sun is completely out of the horizon. In such a short time of less than half an hour, the sky is the most colorful. The color of the cloud is also derived from this. Similarly, when it is exhibited in Europe, the name will be determined based on the time of the place of exhibition in Europe. The sunshine of the present day is not the sunshine that shined on the lake at that time. Can the rainbow appearing on the works right now remind us of the once-related relationship with us or maybe it is the vitality of the lake that gave birth to one civilization?